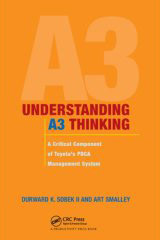 For interested organizations both Prof. Sobek and Art Smalley are available to deliver workshops or presentations on the topic of A3 Thinking. Both Prof. Sobek and Art Smalley possess a wide range of skills and background on this topic including but not limited to engineering, product development, manufacturing, health care, and other services. If you are looking for a speaker or trainer on this topic please do not hesitate to contact us via the website and make an inquiry. For those interested in purchasing a copy of the book please visit the direct links below.